This is something we are extremely excited to show off. It’s a nifty new feature called Convert Text into Shape. Once the text becomes a shape, you can then do all kinds of cool stuff that is simply beyond text formatting. 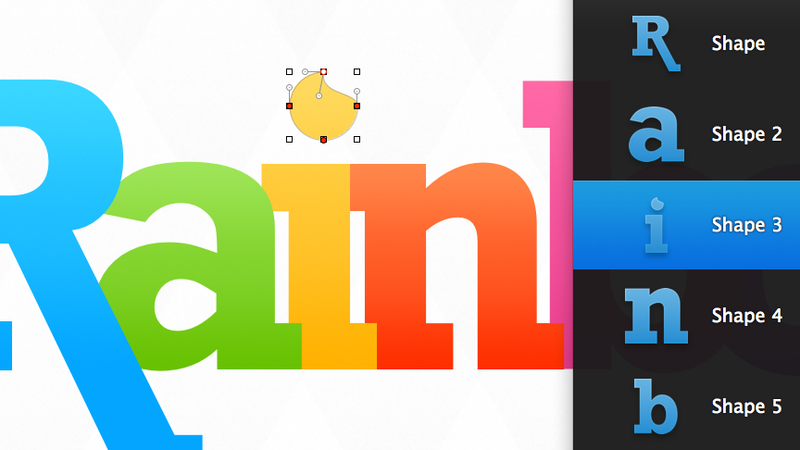 You can easily apply gradients, shadows, strokes, or even, if you want to, reshape individual letters. And this is just one of many delicious goodies we have lined up for the major update. Stay tuned for more! P.S. Pixelmator 2.2 Blueberry will be a free update via the Mac App Store. Oh, I am excited. Thanks for all the hard work you put into this app! I tell everybody about the wonders of using Pixelmator. Does 2.2 update will be free? I’m thinking on buy it at Mac App Store. Yup, it will be free! All of the Pixelmator major 2.X and minor 2.X.X updates are free. Layer styles, layer styles, layer styles, layer styles, layer styles, layer styles, layer styles, layer styles, please! I can’t view the movie on iOS 🙁 Only me? Aaaaaand now it works 🙂 Looks awesome! This is going to make using Pixelmator much more enjoyable. Few things of note. You guys are doing a much better job keeping us informed. Good idea. Gradient on shapes! Oh yeah!!!! I personally can’t wait for 2.2 Blueberry now!! I have got a client in mind that when using this feature is going to blow his mind! His company logo just lends itself to this kind of feature! I just hope it is here in time for when i have to submit my drafts! Keep up the great work Pixelmator!!! You guys make a fantastic product, and I’m really glad about the continued support. I’ve told just about everyone I know with a Mac, and some people who don’t have one! This is just wow! 😀 I can only hardly wait for this apparently great update! Please keep us up to date or better release it soon! I can’t wait to try! When??? Meanwhile, all I want is the ability to have fixed and aspect-ratio-based selection sizes (i.e. 640×1136, 16×10, etc). Still worthless to me without this basic feature. What I’m hoping is this means added support for SVG. Because with these features I can start using Pixelmator as part of my normal workflow, not just for my own personal stuff but as part of my actual job. I can’t justify $600 on Illustator just so I can make an SVG every so often, but I can justify Pixelmator pretty easily. Honestly, you guys could double the current asking price and still be a deal. But you’re a bit cruel 😉 because now I want this feature so badly. WHEN are you planning to release Blueberry, please? Thank you in advance !!!!!!!!!!!!!!!!!!!!!!!!!!!!!! Will we have 2.x Blackberry? Pixelmator team, you really rocks. I can’t wait for 2.2, but have to ask: you put the option to choose more than pentagon in create polígono shapes? Because its anoying just have one option. Contrats and keep the good work! Beutiful!!!! Looking forward to it!! Check out the 5th icon in the tools palette, isn’t that a quick selection tool? Neat! I am soo psyched for this! but here is another question.. when will an app for the ipad be developed ? I love that about idraw ..
Wow…. I’ve been a Graphic Artist since 1992. My first Pro Apps were Photoshop 5.5 and Aldus Freehand 8.0 since then I was up to date paying large amounts of money to have the “best tools” for my work. When Pixelmator arrive I was using Adobe CS2, When I learned enough about Pixelmator I realized I can do almost everything without Photoshop (surely I was more fast and productive with Photoshop because it was my most used tool but it was when Adobe launch CS3 that I was sure enough to quit Adobe for real and start working with my new tools. Pixelmator has been easier, efficient and none of my clients can’t tell the difference. The Pixelmator community remember me the first steps of Photoshop days when People were amazed with it. This means Pixelmator will become the tool of choice for Mac users in the Graphic arts eco-system. My Coding apps are: Espresso (was a Coda user but I liked better Espresso now just a personal desiccation), Hype and Code Collector Pro. As you can see the new Graphic Office can be made from the Mac App Store and from pure Mac apps alone. Can this be used to have the text follow a path? Vectors and forms: new function to convert the text is great, and the inclusion of more advanced forms, too. My opinion is that, as someone said before, it will add greater compatibility and support for SVG files, Inkscape is a vector editor excellent, probably many users are using. Direct import would be great! This feature is essential and urgent, please we need it. I installed the GIMP just to make my patterns. It seems very meager 🙁 We do not want a clone of PS, but we do want great tools with good options. For now is what, in my opinion is a priority, I leave time to continue working. As far as we can see from the palette in the movie, these option (layer styles) are ONLY for SHAPES. Lets hope they will also be available for all other (pixel) layers! I’m very excited for this update! One thing I so badly wish for is the ability to do seamless patterns! I keep waiting to see if you guys do an update and add that feature; I really don’t want to spend the money on Adobe just for that! I would even be willing to pay extra on Pixelmator for it. Other than that, Pixelmator has been able to fulfill all of my designing/editing needs! I really can’t think of a better Mac app, regardless of the genre or developer. That said, I can’t think of editing images without Pixelmator anymore. And it’s really easy to put a smile on peoples faces when suggesting them to try Pixelmator instead of PS. A big thank you for all the great work you’ve put into Pixelmator. Using it is a joy. I guess you’re just a troll, then? People here seem to be awfully happy about _finally_ getting (some kind of) Layer Styles, but far be it from you to accept that it’s a necessary feature and that it makes sense for people to be excited about it. Anon Cowhead calling someone a troll for speaking the truth? What a moron. From the way I see it, Pixelmator is created by a small team and they are providing one of the most useful Mac apps on the market today at a price that pretty much everyone can afford to pay for instead of steal. It appears they carefully choose what features they can successfully integrate into their workflow a few at a time. I imagine that a lot of it comes down to the fact that you can’t put the cart before horse. On the other side of the coin it is their current and potential customer base asking for new features they feel are most useful or needed by them that gives them an idea of what they will try to work in next. I’m certain they have their own roadmap but comments often do have a positive affect regardless of their tone. Although I do tend to agree with hamsta’s argument that people making statements that Pixelmator is some how not able to sit at the big boy’s table because a feature they need for their workflow is childish. We can all ask for the features we want without resorting to putting down the small team of developers working on a product that most of us find amazingly easy to use and powerful. They will most likely get to all the most important features as quickly as they possibly can. So, dear developers, any news about 2.2?? I am happy to wait for whatever improvements are made to Pixelmator in 2.2. It should be worth waiting for and i really look forward to its release. I have tried many windows and Mac based image editors from the biggest to the smallest. Pixelmator is the easiest I have used being a mid-level user. it has what I want/need and is easy to use. i keep this in mind as I patiently await 2.2. This is my editor of choice for a reason and i have stopped looking for alternatives. Hi, this feature is great and I’m having a play with it now. The video doesn’t how how to separate each character into a different layer to allow for the individual gradients to be applied. How do I do that? Thanks. I try to use a copy shape style but when paste a nothing happened i cant see a new shape. 🙁 …. Any ideas! Please let us know if there is a shortcut or easy way to separate each letter to a different layer. The video is a little deceptive as it shows text in one layer at the start then switches to many separate layers without showing how it’s done.